A shocking incident took place on an Indigo flight from Singapore to Chennai this morning. 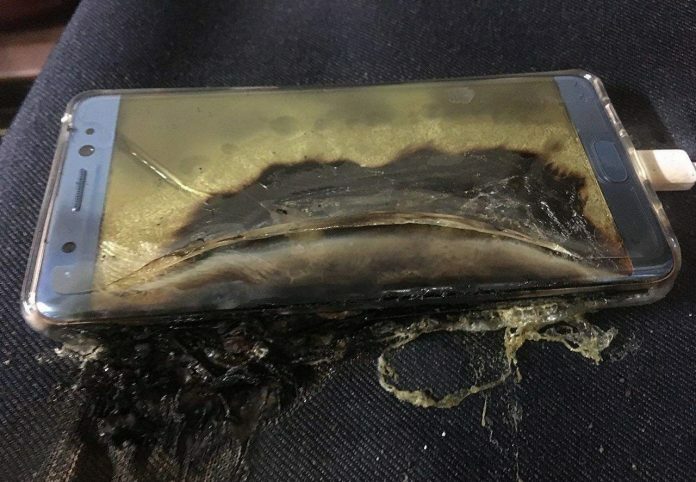 Samsung Note 2 phone caught fire in mid-air. The incident took place at 7:45 am and Samsung officials were called by Director General of Civil Aviation for discussion on the matter. Fortunately, the flight crew observed the smoke originating from an overhead baggage bin and managed to control it using a fire extinguisher. Later the Smartphone was dropped into a container filled with water in the lavatory. “The crew quickly identified minor smoke coming from the hat-rack of seat 23 C and simultaneously informed the Pilot-in-Command who further alerted the ATC of the situation on board,” the airline said. The aircraft made a secure landing at Chennai airport and no damage was caused to plane and passengers were deplaned safely. Earlier, DGCA officials advised airlines to make an announcement to switch off all Samsung phones on the flight. As per reports, Indigo Airlines informed DGCA about the handset to be further examined by concerned authorities to trace out the main reason for this mishap. “We advise flyers to exercise caution while flying with Samsung Note Devices. They should either keep these devices switched off or not travel with them,” said a DGCA spokesman. A meeting is scheduled on Monday between the DGCA and Samsung officials for further explanation regarding the incident. This is for the first of its kind to happen where a Samsung Galaxy Note 2 to catch fire. Samsung’s previous flagship model Note7 was facing the issues of catching fire or exploding. With this incident, Samsung had to recall over 2.5 million devices across the world. The Smartphone maker is managing to recover from the Note 7setback and planning to re-launch a fresh set of safe devices.